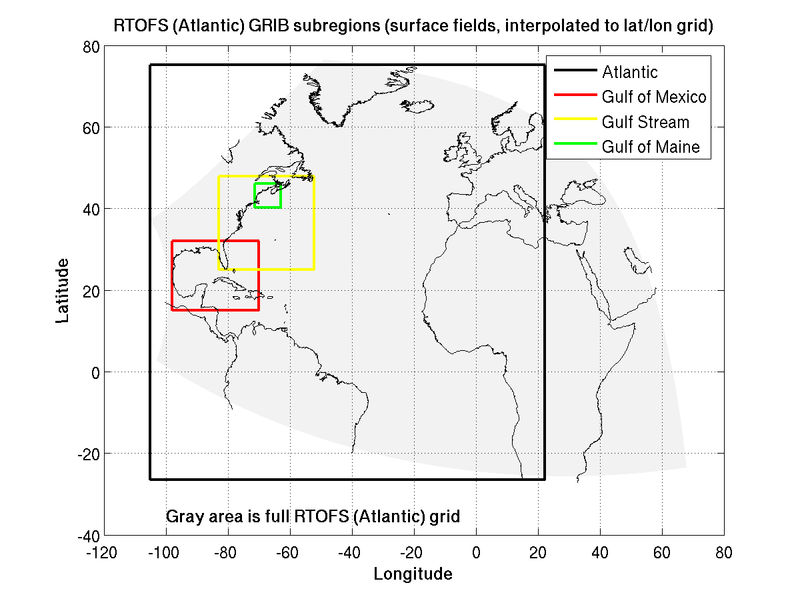 Notes and information on the Atlantic RTOFS model data. Notes and information on the RTOFS GRiB files and parameters. General information on working with GRiB files. Using Ferret to access Atlantic RTOFS model data on NOMADS/DODS. 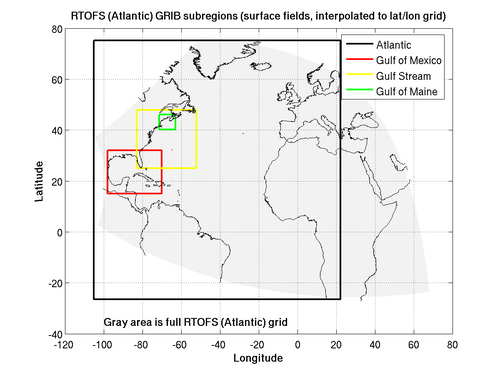 Additional documentation on using NOMADS/DODS to obtain Atlantic RTOFS model data is listed below. You may need to install the free Acrobat® Reader to view them. In addition to the full-field data sets available from the MMAB FTP and NCEP NOMADS (GDS/DODS) servers several additional subregions are available through the NOMADS server. These are surface fields derived from the full-field data interpolated to a regular lat/lon grid. A map of the surface field subregions interpolated to a regular lat/lon grid. The full-field data sets on NOADS and the FTPPRD server are in the model's native orthogonal curvilinear coordinates in the horizontal, and are interpolated to 40 pressure levels in the vertical. Here is a list of the interpolated depths. 1Note that the u and v horizontal velocities are in the frame of reference of the model grid, not rotated into lat/lon coordinates. Rotation routines in Fortran and MATLAB are available here.